Our gardens are teeming with insects, mites, spiders, and other creatures. To a new gardener every "bug" is a likely suspect. As we learn more about gardening and that elusive thing called "the balance of nature," we discover that very few insects are pests worth our concern. Most are either beneficial, of no direct significance, or have a role yet to be understood fully. The fraction that is pests get a lot of attention. A few stink bugs on a tomato plant or some hungry flea beetles on an eggplant seedling are indeed cause for concern. However, our efforts to control these pests can have a direct effect on the "good guys of the garden." Most sprays, whether organic or synthetic, tend to not discriminate between pests and beneficials. When you spray the garden, pests will be killed but so will beneficial insects. When you kill a beneficial insect you inherit its job. That lady beetle larvae may be about to eat several dozen aphids. When it dies, controlling those aphids and their thousands of potential offspring is now your job. Lady beetle larva eating aphids. In the old westerns it was easy to tell the good guys from the bad guys. Good guys wore white hats; bad guys wore black hats and were the ones shooting at the hero from behind those rocks in the box canyon. Unfortunately bugs don't wear hats, so we have to work a little at learning who's who in the garden. We gardeners would do well to learn who these good guys are so we can monitor their presence and avoid spraying unless absolutely necessary. Adult lady beetles (pictured), bees, and praying mantids are familiar beneficial insects, but there are many more, such as green lacewings, hover flies, ground beetles, and soldier bugs. And often the immature stage of the “good guys” looks completely different from the adult insect. (What appears to be a picture of a tiny alligator on a leaf is actually a hungry lady beetle larva busy hunting down aphids.) Check out on-line resources and garden books for pictures of all the life stages of the helpful insects you’d like to welcome in your garden. Beneficial insects are part of the natural ecosystem. They can be "managed" in ways to encourage them to stay around and increase in population. Here are four simple ways to attract beneficial insects to our gardens and to make sure they stay around. Provide an accessible source of water. A birdbath with some stones that stick up out of the water to provide easy access for tiny beneficials or a periodic sprinkling will work great. Plant flowers to provide nectar and pollen for beneficial adults to feed upon. Species such as syrphid flies and parasitic wasps need this for an energy source. Among the better pollen food sources are plants that have umbrella-shaped bloom heads, such as dill, yarrow, tansy, and fennel. Other plants to include are those with small daisy-like flowers (such as chamomile and feverfew), and other blooming herbs (thyme, oregano, rosemary). If you plant root vegetables, leave a few to go to seed (carrots, radishes, turnips) as their blooms are also favorites of some beneficial insects. Allow some pests to remain as a food source for beneficial insects. Zero pest populations are not sustainable and will leave beneficials with no reason to stay in your garden area. Lady beetles are our friends but they are not philanthropic! They lay eggs on plants with pests present so their babies can have food. No pests ... they move on. Just remember that it's good to have a few pests around. 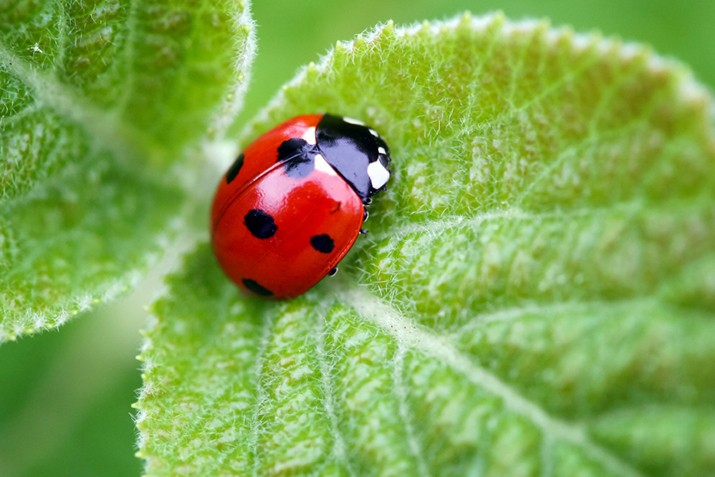 Avoid pesticides that may damage beneficial insects. This includes both organic and synthetic products. And don’t spray indiscriminately. Before you use any pesticide, make sure you have identified that a pest is indeed causing a problem and what type of pest it is. When a situation warrants a spray, select a product with a narrow spectrum of control (such as Bt that only targets caterpillars) to avoid killing other insects. Choose one that breaks down fast when possible, such as insecticidal soap or neem. Direct the spray only at the plants with the pest problem. Try these tips this season and then take a few strolls out in the garden and give things a closer look. You'll see many species of beneficial insects helping you out by munching on those pests that love to munch on the fruits of your labor. Information courtesy of the National Gardening Association, www.garden.org.